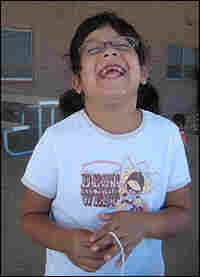 Students Blossom in the Desert There are just 11 students at California's Death Valley Elementary, one full-time teacher and one teaching aide. The small-school environment helped one pupil overcome speech and language delays, and many of her classmates are working above grade level. One-room schools still exist, but they've dwindled from 190,000 in 1919 to fewer than 400 today. 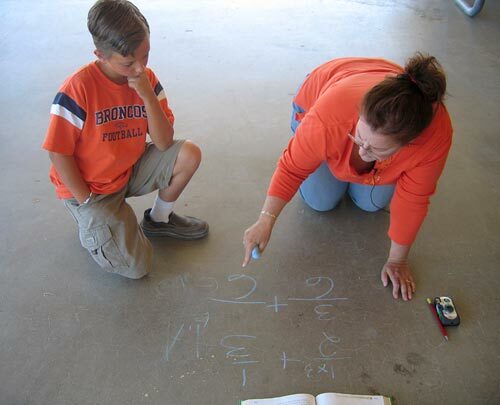 Teacher Leslie Rowan works a math problem with fourth-grader Leo Kullman IV. Students play kickball outside Death Valley Elementary. 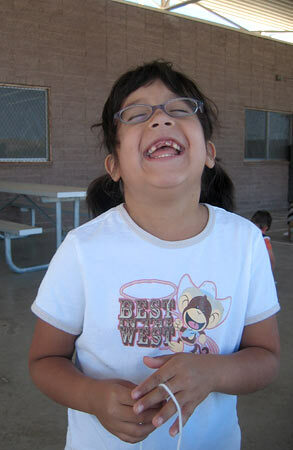 A smiling Taylor Alford, age five, will begin first grade in the fall. 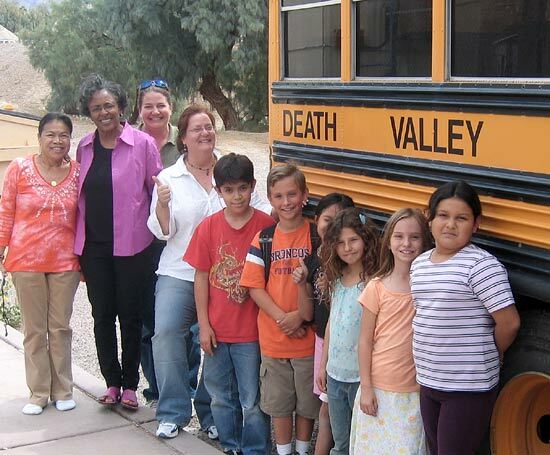 Some of the students and staff of Death Valley Elementary. The one-room schools still left in America are mostly found in isolated places, where the natural world is the major factor in peoples' lives, like Death Valley, Calif. It's the hottest, driest and lowest place in America, a two-hour drive west from Las Vegas through a searing hot desert. In the summer, temperatures on the valley floor can reach 120 degrees and a flat tire on an open stretch of road can get you in trouble fast. In the spring, tourists come from all over the world to see the natural wonders: crystalline salt popping out of the ground, sand dunes surrounded by mountains, vibrantly colored, unearthly-looking rock formations and, if there's been enough rain, blooming wildflowers. Most of the 500 people who live in Death Valley year round are connected in one way or another to Death Valley National Park and its major concessionaire, a company called Xanterra. Without the jobs they provide, few people could live here, and there certainly would be no one-room school. 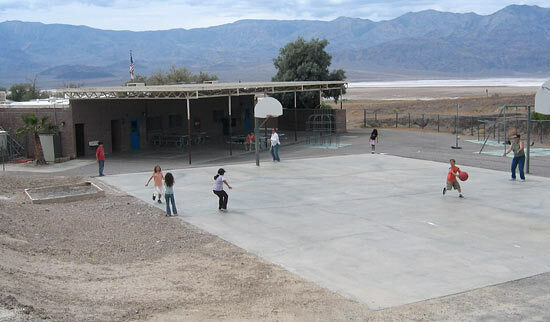 Down the road from the park visitor center at Furnace Creek is Death Valley Elementary school, a flat-roofed building beside a dry streambed, which blends easily into the gray-brown landscape. This year there are 11 students, from kindergarten through fourth grade, one full-time teacher and one teaching aide. One of the students is 5-year-old Taylor Alford, who started kindergarten last fall unable to speak. Her mother was worried. She said Taylor just kept to herself at home, wouldn't interact with anyone. She didn't know why. The teacher, Leslie Rowan, remembers that Taylor only pointed and grunted and often seemed confused. Three specialists had evaluated Taylor. They said she had speech and language delays and auditory processing problems. She was three to four years behind where she should be and might never catch up. At the very least, they said, she needed speech therapy. But Rowan says she could tell by the "sparkle" in Taylor's eye that there was more there and she was eager to teach Taylor. Now, seven months later, Taylor is beginning to read and does first-grade math. How did this happen? Because her school is so small, Rowan had the time and flexibility to work with Taylor. She devised a curriculum for her that involved a lot of one-on-one work in all subjects. She brought in a volunteer, a former pre-school teacher named Olivia Dotson Reynolds, who tutored Taylor. Taylor's classmates helped, too, by encouraging her, working with her and especially by including her. "No one is excluded in my school," says Leslie Rowan. Studies have shown that students who come from poorer communities like Death Valley have a lot to gain from attending a small school. In fact, a small school can make up for the factors that often stifle student achievement. Of the 11 students here, four speak Spanish at home, five are being raised by single mothers and all of them qualify for a free or reduced lunch. Still, nine of them are "high achieving," working above grade level in some subjects. It's hard to know whether Taylor would have made such dramatic progress in a larger school. It's likely, Rowan says, that there would have been more professional services available. But she's convinced that it was the small size of the school -- where lives are intertwined and it's hard to fall through the cracks -- that made the difference.